You want exceptional investment returns with minimum effort? Here’s the man who says that his strategy can. 12:58 – Why It is Difficult For Most Investors To Practice “Acquirer’s Multiple”? 17:04 – Can You Apply “The Acquirer’s Multiple” in the Asian Stock Market? 21:46 – How Many Stocks Should You Invest In? When it comes to investing, most people will reference Warren Buffett. We have mentioned in our recent videos, why you cannot invest like Warren Buffett, the billionaire. 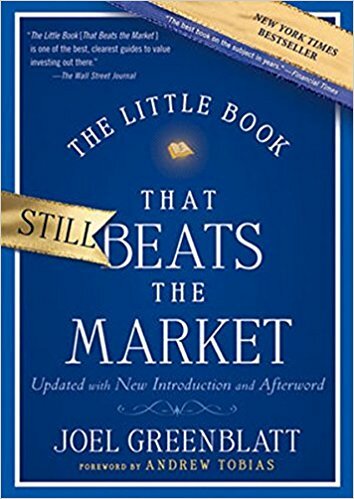 In 2006, Joel Greenblatt wrote a book called The Little Book that Beats the Market in which he introduced an investment strategy called the “The Magic Formula”. Does “The Magic Formula” really work? In 2012, Tobias Carlisle partnered with a PhD student from the Byrd School of Business, to test “The Magic Formula”. They applied extreme market conditions to test if “The Magic Formula” could still deliver market beating returns. And they found that it does in fact beat the market pretty comprehensively! Tobias and his team did not stop there. “The Magic Formula” was known to relied on two factors – “quality“ and “value”. Tobias’ team broke down the returns to find out if the factors contributed equally to the returns. Surprisingly, they discovered that the quality factor (i.e. return on invested capital) actually dragged down the return. If used alone, it would have underperformed the market. On the flip side, the value factor (i.e. the operating income on enterprise value factor) generates all of the returns and more. It was able to mask the negative effect from the quality factor! Tobias’ theory on why “Return on Invested Capital” dragged down returns? Investor strategist, Michael Mauboussin has been searching for distinct reasons that could point out companies which could maintain their profitability over 10 years. He studied companies within rolling 10-year periods and used DuPont Analysis to break down and determine what drives their returns. However, he has yet to find a scientific method that consistently identifies stocks that can outperform in the following 10 years. However, he did notice that at the end of the 10 years, that about 4% of stocks do maintain their profitability over the full period. Further studies are not conclusive. The ability to identify the 4% is through random chance. 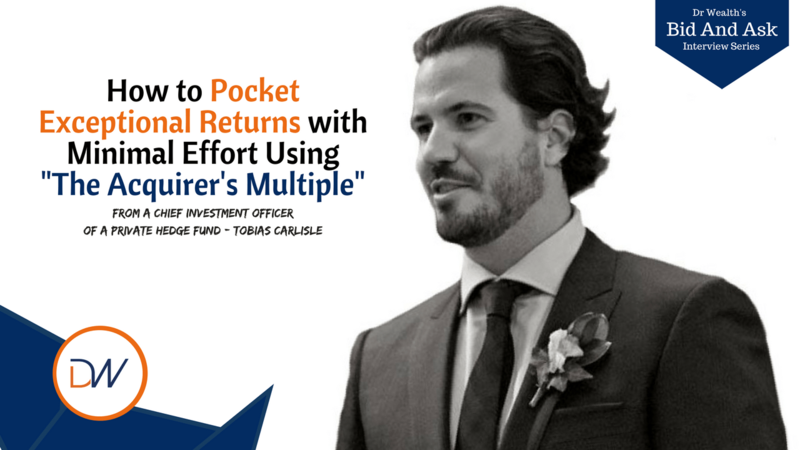 Tobias believes that by removing the “return on invested capital”, you can get better returns. Tobias reveals more in his book, The Acquirer’s Multiple as well as at his website, www.acquirersmultiple.com. He also reminds us that a value investor’s advantage is his ability to hold investments over longer terms. A ‘bad’ looking, deep value company with sufficient cash and cashflow would be able to survive through your investment period of at least 2-3 years. He noticed that once the company survives the ‘bad’ years, it tends to start looking healthier and doing better. The ‘Value’ factor alone is great. But some companies deserve to be priced lowly because of their situations. They do not hold any value that you can unlock. From Tobias’ experience, you’d often find them all together. And, these situations are often only detected after the collapse, rather than during the bull market. Simply because it is easier to connect the dots only after a collapse. Value investors have to be vigilant during the bull market, and do their due diligence before investing in deep value stocks. As a fundamental investor, you’ll need to look at a company’s financial statements. Does the cash flow match the reported accounting earnings? Does the reported assets match the cash flow? How much money does the company have in the bank? You should avoid companies that have conflicting figures. Truth is, it’s actually very difficult to pick out all the intricacies of financial statements when you first start out. You can learn all about financial statements at a university or through a CFA, but it takes experience and practice to really understand how the numbers really work, the subtle hints within the numbers and how one industry varies from another industry. A good quantitative method employs criteria that removes the need for an investor to analyse financial statements deeply, by themselves. It gives you a simpler way to work with the numbers. With that said, Tobias also noticed that new investors may not be clear about their investing goals. Many are satisfied with market returns, and they really don’t need a DIY approach to investing. His advise for new beginners investors is to buy a cheap index fund to get market returns, while they learn about the intricacies of investing. For those who want to beat the market, you should know that it’s very very difficult to do. Even the professionals can’t do it most times. ​Tobias mentioned that the only way for an investor to beat the market, is to do something different from the rest of the market. Instead of buying hot stocks like Tesla, Netflix or Amazon, you’d be investing in companies that nobody’s ever heard of, or they think it’s a disaster. You hope to be proven right (based on your research and analysis) down the road. At the same time, you must understand that there’s always a risk that there’s a black swan out there, and it could send the company to zero. That’s why it’s cheap. As an investor, you should be going in and finding other things that could sharpen upyour analysis of a company. Research have shown that statistical rules tend beat the experts’ results. An expert who is given access to the simple statistical model, but decide not to follow it, usually does worse than the model. This is due to “The Broken Leg Phenomenon”. What is “The Broken Leg Phenomenon”? Imagine you have a model that tells you whether somebody will go to the cinema on a Friday night. This model could include criteria like; “whether it’s raining or not”, “the type of movie that’s on”, etc. And you learn one day that a movie-goer had a broken leg. That information has not been considered by your current model. Should you include that as a new criteria in your current model? Because you’ll find too many reasons to override the model, to many new criteria for your model; there are just too many “broken legs”. Tobias warns that when you’re looking at deep value companies; they’ve all got “broken legs”. And the “broken leg” is the reason why they’re cheap! When you buy a company knowing that it’s got a “broken leg”, you believe that once the broken leg gets fixed, the company should be trading much higher. If you eliminate a company for your own reasoning, you might be picking out the stocks that could potentially bring you the excess returns. By the way, Joel Greenblatt has also mentioned that people who try to cherry-pick from the list of “Magic Formula” stocks, did worse than the index. Why Is It Difficult For Most Investors To Practice “The Acquirer’s Multiple“? Firstly, Tobias have noticed that it is very confronting to learn that a model that is as simple as “The Acquirer’s Multiple”, seems to do very well over long periods of time. Especially since about 80% of professional money managers can’t beat the market. Most investors simply can’t believe that this is all you’d need to beat the market. Secondly, as with most value investing strategies, the “Acquirer’s Multiple” does experience periods of underperformance. And when it’s underperforming, investors will start to question the strategy. Some will make tweaks that nullifies the system. Tobias shares that he too has to struggle with doubts when he looks at his portfolio…and he does so frequently. This means, if these companies can survive for another 12 months, they should become much more valuable stocks thereafter. And that’s what Tobias and his team has experienced over the last 12 months. Last year, Airlines had a very good run. I was buying Airlines before Buffett announced that he was buying Airlines. There were six or seven of them at one time in the screen, so I bought them. And then shortly thereafter they announced that Buffet bought some of the same shares and that was a good one. Most investors tend to follow Buffet and he has described his investment strategy pretty comprehensively in his letters. If you have read the letters, really what he’s talking about all the time is how to find a moat. However, most investors would not be able to follow Warren Buffett’s strategy. Instead, you’d probably do better if you can find a methodology that suits your lifestyle. Tobias says “The Acquirer’s Multiple” suits his investing style, plus it works if you can buy stocks cheaply enough. But here’s the funny thing. Apple came into my screen a few years ago and it was one of the cheapest 10% of large-cap stocks. Probably because people were concerned that the iPhone is getting boring or there’s other competition for the Apple TV, it got very very cheap. And so I’ve sorted the screen again and I tweeted out about it and told everybody that it was in the top 30 cheapest socks in the States at the time in the large cap sector. And Buffett bought it afterwards. Tobias have noticed that Buffett buys companies at such huge discounts that it doesn’t actually matter if a moat exists or not. But he also notes that Buffett has more than 60 years of investment experience. So he has the ability to look at super cheap companies and decide if they have a good chance of surviving and maintaining their moat. Most of us don’t have that ability. Can You Apply “The Acquirer’s Multiple” in the Asian Stock Market? Tobias shares that here have been research done on the application of “The Acquirer’s Multiple” to every developed market and every large stock market in the world. In every developed market be it in Asia, in Europe, the U.S., the UK, Australia, New Zealand, it has been shown to be able to generate higher returns. He is confident that “The Acquirer’s Multiple” is very good at identifying the cheap stocks, the overvalued stocks, and the spread between the two. The bigger the spread between the cheap stocks and the expensive stocks, the better the return. If you buy “The Acquirer’s Multiple” stocks as a portfolio and if you have enough time, they will tend to beat the market. 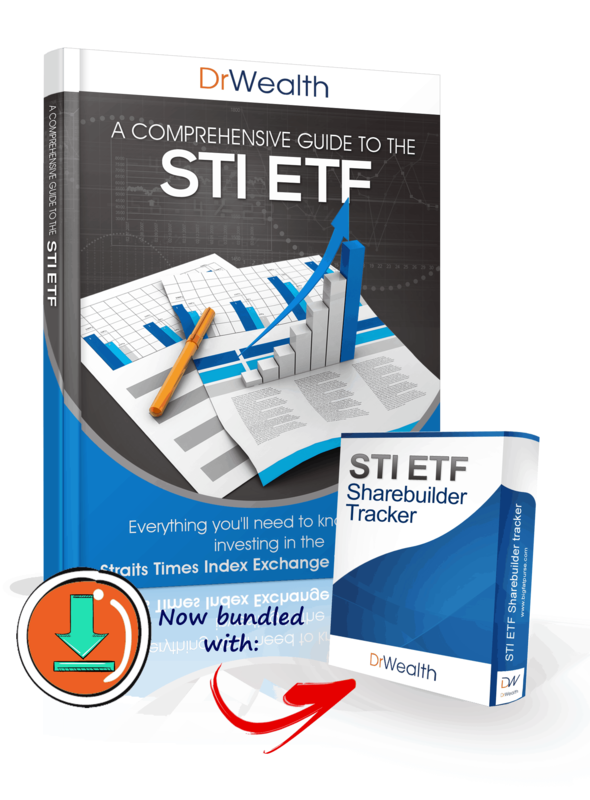 Are Paid Financial Data Necessary For The DIY Investor? Most countries have a pretty good financial data. There are lots of good services that help you with screening for cheap companies. Of course, if you’d want the data calculated and churned for you, those services will require a fee. Most are not cheap. Instead, you can hand calculate these things. You can find the financial statements to calculate the operating earnings and the enterprise value. Should You Avoid Family-Dominated Companies? Many investors are wary of family-dominated companies because it is believe that these companies do not wish to unlock value. They could become value traps that ties down your capital over a long period of time. To counter this, Tobias suggests that you should monitor them over the course of a year to understand if the management or the major shareholder is abusing their position. If you spot anything after the first year, you might want to get out. But sometimes this is the “broken leg”, or the reason that the stock is so cheap. Hence, Tobias suggests that if the stock is considered cheap, even when you consider the potential value trap situation, it might be worth holding on. You should still monitor and reassess the stock on a yearly basis. How Many Stocks Should You Invest In? Diversification: how diversified do you need to be in order to be protected from any individual stock getting too big. 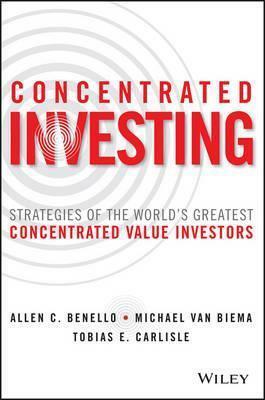 Concentration: the way that you generate better returns. An example of a concentrated portfolio is a portfolio of say, 5 stocks. The problem with investing in a small number of stocks is that it is enormously volatile. The performance of any given stock is essentially 20% of your whole portfolio. If one of those companies goes to zero, you would have lost 20% of your capital. With a good metric, you will tend to get better performance with a concentrated portfolio. If you experience a crash and the markets down 50%, you might be down 80%. But on the flip side, when the market goes up 30%, you go up 50%. However, there’s a lot of risk in managing a concentrated portfolio. Tobias urges that unless you are very experienced and know how to manage your bids well, most investors should avoid using a concentrated portfolio. How To Use The ”Acquirer’s Multiple” to Manage a Concentrated Portfolio? Using “The Acquirer’s Multiple” screener, you can either select the top 5 or carry out qualitative analysis on stocks that appear on the top of the screener and fish out 5 suitable stocks. Again, you have to be careful with a concentration portfolio because there’s a lot of volatility and you can lose a lot of money. How To Use The ”Acquirer’s Multiple” to Manage a Diversified Portfolio? If you are going for a diversified portfolio, then you would want to buy the cheapest stocks. You’re better off with about 20 – 30 positions. That means if any one of them goes to zero, you’ve lost only ~3.3% of your capital. There’s a lot of bad advice out there. We asked Tobias Carlisle for the ONE he hates most. Tobias’ #1 peeve is the “efficient market hypothesis”. He says it makes investors think in the wrong way. However, he admits that ​if you don’t want to spend a lot of time thinking about your investments, it’s probably not a bad way to go. The efficient market hypothesis, is a bad philosophical background for a pretty good idea of just buying the market index. If you buy the market index during the bull market, it’s filled with very expensive, overvalued stocks. Indices are market capitalization weighted, which means the more expensive the stock is, the bigger proportion of the portfolio it takes up. So if you’re buying the market index during the bull market, you are buying a lot of expensive companies and the risk reward isn’t very good. The advice above would be okay for folks who just want market returns, and cannot be bothered to learn more about investing. As for investors who want more, Tobias thinks you’re better off finding value—doing value investing yourself or finding managers who have a good process that’s clearly articulated and that they actually adhere to that process. You must also recognise that there will be periods of underperformance. These periods makes investors anxious and cause them to lose their conviction about the investment strategy that they’re following. For the cheap companies, they go long. For the financially distressed, potential frauds, earnings manipulation, ugly balance sheet, deteriorating financials, they go short. Carbon Beach go long on undervalued cash generative companies, or the hedges. I.e. If the market looks like it’s falling or if the market goes into a downtrend, it would hedge in an effort to generate returns that don’t match the market. They dig into the company data to make sure the data is correct. They look for other things that cannot be screened for. They try to find things that might affect their valuation. Once they decide on the valuation, they go quantitative from that point on. They’ll buy and sell based on that valuation they had calculated previously. To add on to the previous point, Tobias emphasis that Carbon Beach does not analyse business at all. The question of “will this business survive” is a very difficult question to foretell, and could lead to a broken leg phenomenon. If yes, they will proceed to making a buying decision quantitatively. If not, Carbon Beach looks into the discrepancy between what the company is showing on its financial statements and what’s actually going on in the business of the company. If it indicates fraud or earnings manipulation, and that’s a company that they would avoid. Sometimes it could just be a timing issue or the way that the business generate income. Some examples include; an insurance business that has difficulty matching assets and liabilities, or a bank that has a different style of balance sheet, or maybe a traditional industrial company. Tobias emphasis that they don’t eliminate stocks simply because they don’t like the business. Rather, they look through the nature of the business and how it’s reflected in the financial sentence. The other strategy that Tobias and his team run is something they term: “Special Situations”. It is a slightly more high level strategy that requires active management and deep research. When those decisions are made, sometimes there’s a difference between where the stock is trading in the stock market and an implied valuation when the event closes. They look for all of those different types of trades. For example, the traditional merger arbitrage. When a company is being taken over. The bid might be $10, and the stock might be trading at $9.75. You could buy the company that’s being taken over and short the company that’s doing the acquisition, to try and get that arbitrage of $0.25 between the two. Carbon Beach doesn’t buy into traditional merger arbitrage directly, instead they wait until the deal gets into trouble. If there’s some risk that the transaction may not go through, or if it looks like the transactions are not going to go through, usually the stock prices will drop. If Tobias and his team think that the company that’s being acquired is still very cheap, they would weigh their odds. The downside might be that the company doesn’t get acquired. If that happens, Carbon Beach would have already bought the stock for cheap. They’d also estimate the likelihood of the acquisition going through and factor the potential risk and reward into their analysis. They’ll look at a position and make an investing decision by weighing the risk-reward ratio for each scenario. Their aim is to try to invest in the way that gives them the best expression of the risk-reward for the situation. If you’d like to get in touch with Tobias Carlisle, you can reach him via Twitter, @greenbackd. 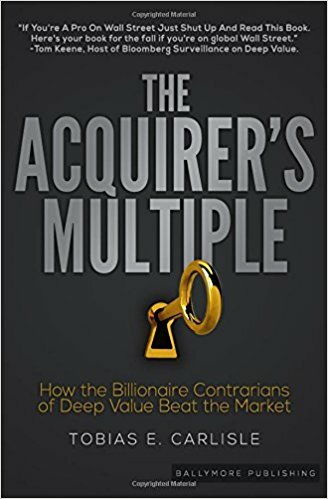 He has just released “The Acquirer’s Multiple”, along with a free screener at www.acquirersmultiple.com, which has got the cheapest 30 of the top thousand stocks in the US at any given time.